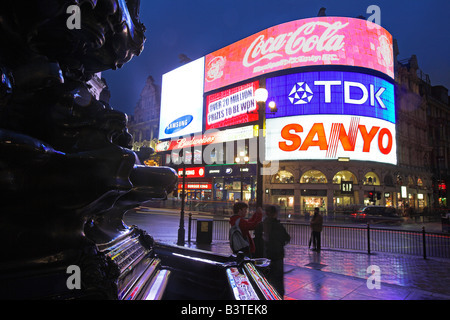 The iconic Piccadilly Lights, now known as "The Curve" at Piccadilly Circus, London. On October 26th 2017 Landsec, working alongside Ocean Outdoor, switched on The Piccadilly Lights after nearly a year of darkness. The Piccadilly Lights has been upgraded to a single 783.5sqm larger than 4K LED Screen, the largest in Europe. The switch on was viewed by over 12m people across the planet, reaffirming the global interest in this London advertising icon, and will be seen every year by over 100,000,000 people. The historic patchwork of advertisers is maintained, available exclusively to 6 advertisers from non-competing categories who rotate positions around the screen every 90 seconds. The new twist to Piccadilly Lights are the full-screen dominations, occurring every 10 minutes, where each of the brands takes over the whole screen for 40 seconds. England, London. Piccadilly Circus by night. Built in 1819, it is now renowned for its neon signs, as well as the Shaftesbury memorial fountain and statue known as 'Eros' It is surrounded by several noted buildings, including the London Pavilion and Criterion Theatre. Directly underneath the plaza is the London Underground station Piccadilly Circus. The iconic Piccadilly Lights, now known as 'The Curve' at Piccadilly Circus, London.